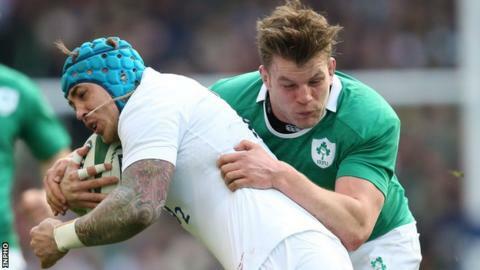 For a player who has featured in both of Ireland's recent victories against New Zealand, it is difficult to believe that Jordi Murphy is preparing for his first Six Nations start in four years. The flanker, 27, has been on one wild rollercoaster ride since that 19-9 win against England that paved the way for Ireland to retain the title three weeks later. Four years that have been filled with highs and lows but now he has been handed a chance to stake a claim for a place in Ireland's World Cup squad. Opportunity has knocked for Murphy and he is ready for it. "There's no beating around the bush, the World Cup is in seven months time, this is a big opportunity and I plan on taking it with both hands," said the Ulster flanker. "They don't come by that often because obviously a lot of the boys in these positions have been playing really well. "Look, I am very much game focused and I know I have to put in a performance this weekend but it's a big opportunity." Injuries to CJ Stander and Jack Conan have presented Murphy with his chance to impress in Rome on Sunday. He will wear the same number eight jersey he wore against England in Dublin in 2015 but in the intervening years the versatile flanker has filled every spot in the Ireland back row. He was on the blindside in the World Cup quarter-final loss to Argentina in 2015 but the following year he was the starting open-side flanker for Ireland's inaugural Test win in South Africa and their historic first victory against the All Blacks in Chicago. A freak cruciate ligament injury 25 minutes into that game at Soldier Field cost him almost a year on the sidelines and knocked him back down the Irish pecking order. Having spoken with head coach Joe Schmidt about what he needed to do to secure his place in the squad, Murphy made the decision to move to Ulster in search of more regular game time. After a European and Pro14 double last season, leaving Leinster was a wrench but the switch has led to more game minutes, increased confidence and the chance to start tomorrow. "I've really enjoyed my time so far up in Ulster," he said of his decision to move north. "It's been an enjoyable couple of months on and off the pitch and we've had some good and bad days but more good thankfully. "I've been in the last two Ireland squads between November and the Six Nations so it has been justified in a way. "I've enjoyed being in the mix every week in both the league and the Champions Cup so it has been great." His arrival in Belfast has coincided with a thrilling run to the quarter-finals of the European Cup and he has struck up a good relationship with Ulster head coach Dan McFarland. "Getting minutes under my belt in higher intensity games is something that coaches here in the past had told me I maybe hadn't been getting a lot of when I was left out of squads so that has stood to me in the last while," Murphy concedes. "Going up to Ulster I was probably going into an environment that wouldn't have as many internationals as somewhere like Leinster with 16 or 17 lads in the international squad. Just to bring that bit of experience and leadership." The move to Ulster has been rewarded by Schmidt as Murphy played in all three Tests against Australia last summer before coming off the bench during the backs-to-the-wall defensive stand to beat the All Blacks for the first time on home soil in November. His involvement in so many of the stand-out moments of Schmidt's time as Ireland coach has led to suggestions that he is a favourite of the New Zealander's but Murphy is not so certain: "There have been times that he hasn't picked me so he mustn't like me that much. "It's just one of those things, he's very much a fair coach, he picks on form and if you produce the goods for him, whether that be in training or you do what he's asking from you when you are back with your province, he rewards you most of the time. "I just hope to repay that faith this weekend."